This marks another sweet victory for the future of medicine. Sugar, that amazingly sweet treat some of us just can’t get enough of, has long been the fascination of children (and those with a child-like sweet tooth). Its ability to be melted down into a glass-like substance enables confectionery artists to create tasty displays worthy of museums, or being served as a 3D printed dessert. In fact, the same properties which make sugar so wonderful for cooking and designing also make it great for science. The University of Illinois announced, in an article published Wednesday, that Ph.D. graduate Matthew Gelber and Rohit Bhargava, a professor of bioengineering and Director of the Cancer Center at Illinois, created a new kind of 3D printer capable of printing detailed biological structures out of sugar. Yes, there are other 3D printers capable of working with sugar. However, unlike typical commercial printers, Bhargava’s uses isomalt – a sugar substitute derived from beets and commonly found in throat lozenges. Once melted down and printed, the sugar structures cool and solidify, creating a sturdy scaffold which makes the structures particularly useful in device manufacturing and in health-related fields such as biomedical engineering and cancer research. 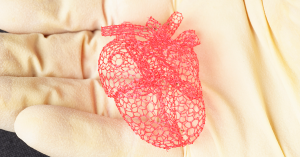 Printing sugar can be tricky when you’re trying to print scaffolds for growing heart tissue. Too much pressure and the result is formless, too much heat and it crystallizes or burns (talk about heart burn). Thankfully, isomalt is less prone to crystallization than typical sugar and resists discoloration when melted. The team was also careful to design their free-form printer using very specific settings. By precisely controlling speed, temperature, and pressure the printer can produce complex isomalt ribbons and tubes that resemble organic structures without burning the sugar or creating overly-fragile structures. After growing tissue around a printed sugar scaffold, as Bhargava suggests above, the sugar would simply dissolve, leaving behind a self-sustaining organic structure. When the sugar dissolves, it leaves behind a series of inter-laced tubes and tunnels that can be used like blood vessels to transport nutrients or to create channels in certain medical devices. The team hopes to develop special coatings to control when and how fast the structures dissolve, similar to coatings that surround medicine in pills. Though it may still be a while before sugar scaffolds are used to 3D print human organs or in hydrogel-based medical devices, the technology is promising, and marks another sweet victory for the future of medicine.